Agh! I hate popups that come up when I mouse-over a lnk. They’re extremely annoying when they contain advertising and completely useless when they offer a preview of the link. I’m ashamed that wordpress enables them by default. Does anybody know how to disable them on wordpress.com blogs? Anyways, Snap.com has instructions for disabling them in their FAQ. 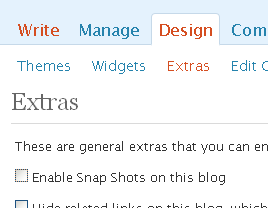 Edit: After a bit of googling, I found a few sites with instructions for disabling them on wordpress, but they refer to a “Presentation” tab which has since been renamed “Design.” Anyways, you can uncheck the “Enable Snap Shots to this blog” checkbox to get rid of them. Just thought I’d repeat the updated instructions here. October 16, 2008. Tags: popups. Uncategorized. Leave a comment.